People have probably worshipped God in Westmill Church for at least a thousand years. Experts tell us that the proportions of the nave are typically Saxon and so are the massive pillars separating the nave from the North Aisle. Outside of the Church you can see in the South-East corner of the nave some typical Saxon decoration. It is known as long and short work. Over the centuries the people of Westmill altered and improved their Church. Probably they made the North Aisle from two small chapels. The stained glass window shown on the left is a fine mid-Victorian example - a memorial to Julia Beaumont 1866. The arches between the pillars date from the thirteenth century. If you look closely at the central pillar, you will find a medieval picture of a man in a boat scratched onto the stonework. There are memorials to the Greg family on the south wall. 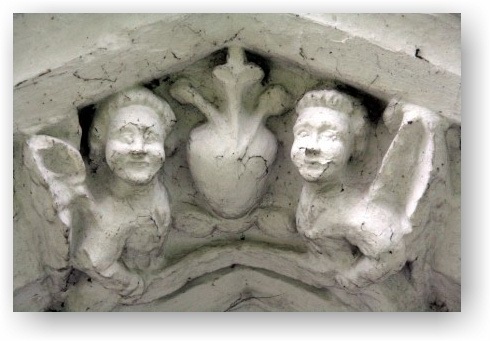 For a hundred years or so they were the local squires, and they are connected with the manufacturing family at Quarry Bank, Styal, Cheshire. The pulpit (pictured right) was given in memory of the last of them. 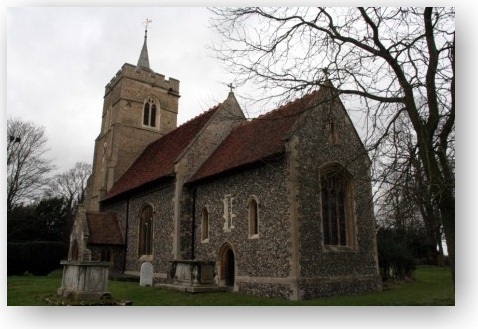 The roof dates from the 15th century and is the highest of any church in the county except the Abbey of St. Albans. The main window of the south aisle wall records two deaths at sea - Edward Rose, drowned 1865, aged 20 and William Hoy, died at sea 1863, aged 19. The window behind the altar (pictured left) was given by a rector, the Rev. Henry Pepys, (later Bishop of Sodor and Man) in memory of his four children who are buried just outside the altar rails by the south door in the chancel. The theme of the window is “Suffer the children to come unto me”. The arch between the chancel and the nave appears to be skewed. We do not think that this was a mistake on the part of the masons, as we believe that in this part of England they adjusted their arches to meet the centre line of the nave roof and we must admire their skill. Many nearby churches have a similar arch. The back choir stalls are decorated with poupée heads. Two of these are original medieval work and two are Victorian copies, done with such skill that it is all but impossible to tell them from the originals. They date from 1876 when the Church was closed for a year while extensive renovation work took place. A picture of one of the medieval originals is shown on the right. The rails where we kneel to celebrate Holy Communion were put there in the late 17th century. There are some 18th century gravestones under the altar platform. These belong to the Bellendens, a Scottish Jacobite family related by marriage to the Dukes of Argyll, who lived in the house which is now the ‘Sword Inn Hand’ Public House. The Bellendens were barons and so their graves show a coronet with six silver balls. 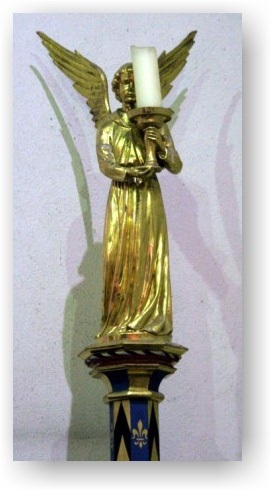 On either side of the altar are two wooden pillars capped with an angel holding a candle. These formed part of an altar which was the last designed by the famous church architect, Sir Ninian Comper. Unfortunately, Sir Ninian, who was then a very old man, did not visit our Church and his design proved to be too large for this building. The other two pillars stand by the font and so the two mark the two vital Christian sacraments - baptism and communion. 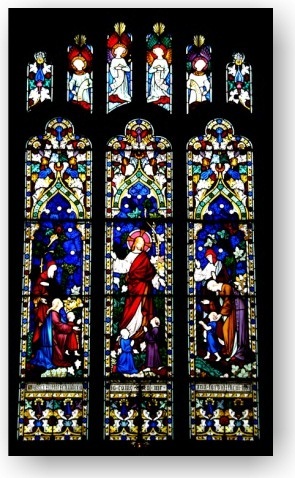 In the west is another Victorian window, this one being given in memory of Robert Hyde Greg. There is much of interest in the tower. 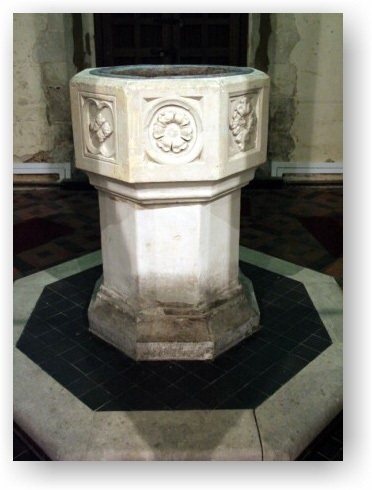 In the centre stands the 15th century font where babies and adults are still made members of Christ’s Church. One side is plain thereby showing that it once stood against a wall. On the south wall is the door leading to the top of the tower, in which hangs a medieval peal of six bells. Once there were eight but three were sold in 1834 to pay for repairs to the roof and other urgent work. The oldest bell (pictured left) dates from 1350. Another bell is of a shape typical of the late 13th and early 14th centuries, but, because of the lettering on it, is often ascribed to the 15th century. It is inscribed "Sancta Margareta ora pro nobis" (Saint Margaret, pray for us), thus suggesting that the church may have been dedicated to Saint Margaret and not Saint Mary the Virgin. 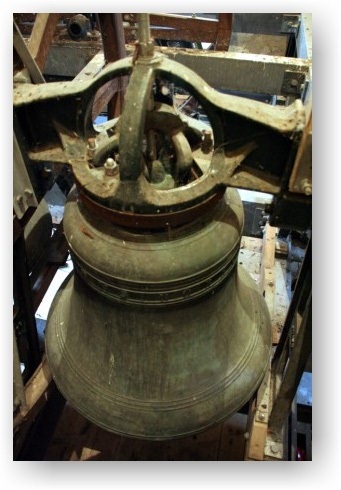 In 1982 the old wooden bell frame, which had been installed in 1702 became unsafe and too old to be repairable. 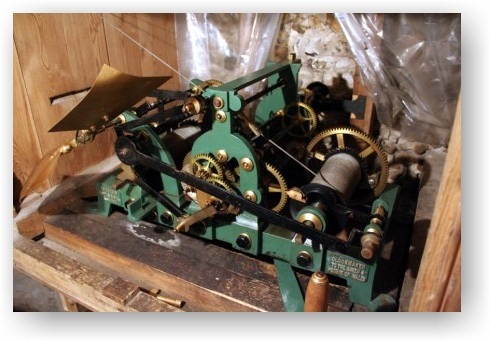 Up until 1999, we were only able to chime the bells by carillon. A new cast-iron and steel frame (shown on the right) was installed in 1999, just below the tower clock (pictured left). One more bell was also obtained to make a peal of six. 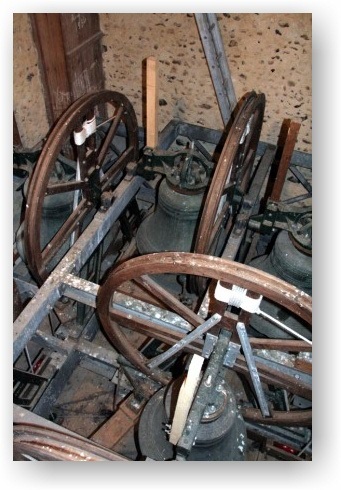 They are rung from the floor of the Tower around the font on a regular basis. Beside the door you will find the oldest gravestone in Hertfordshire, hung on the wall in 1876 for safe keeping. It is that of Sir Nicholas de Lewknor, Lord of Westmill until his death in 1296 AD. Outside of the Church there is an extremely fine west door with the two angels holding flaming swords flanking a pierced heart. We hope you have enjoyed your virtual tour of our church and look forward to seeing you in person one day!